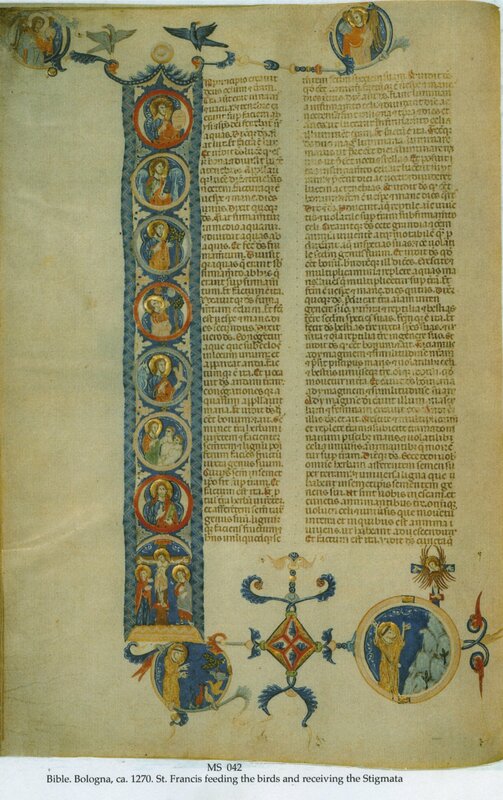 Description	 MS in Latin on vellum, Bologna, Italy, ca. 1270, 534 ff. (complete), 35x24 cm, 2 columns, (22x15 cm), 51 lines in a Bolognese Gothic book script of high grade and medium quality, 1237 initials with marginal penwork in red and blue, 95 large decorated initials in colours, 69 large historiated initials in colours, 18 large historiated initials with marginal extensions with miniatures in roundels in colours, full-page illuminated historiated Genesis initial with 2 miniatures in roundels of St. Francis feeding the birds and receiving the Stigmata, by a close follower of the artist of Bibliotheque Nationale MS. Lat. 22. Binding	 England, late 19th c., blindtooled green morocco, sewn on 5 cords, by Leighton. Provenance	 1. Erwin Rosenthal, Berkley, California (until 1945); 2. Countess Estelle Doheny, Camarillo, California (1945-1958); 3. St. John's Seminary, Camarillo, The Archdiocese of Los Angeles (1958-1987); 4. Christie's 2.12.1987:139; 5. De-accessioned to Sam Fogg, Sept. 2003. Commentary	 The artist is the one described by F. Avril in 10 Siecles d'Enluminure Italienne (1984) nos. 26 and 27, as among the most outstanding examples of Bolognese illustration of the 3rd quarter of 13th c.
Exhibited	 University of Oslo. 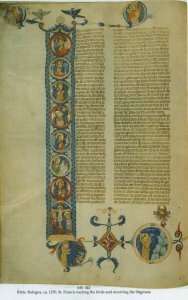 Domus Bibliotheca, 6-15 May 1996: European medieval manuscripts from The Schøyen Collection.